Down the mountain full of snow with the sun at my and I stop to take a photo. The photo to remind me of a wonderful day and a wonderful time and how great mother nature can be. Shadows on the freshly groomed trails. 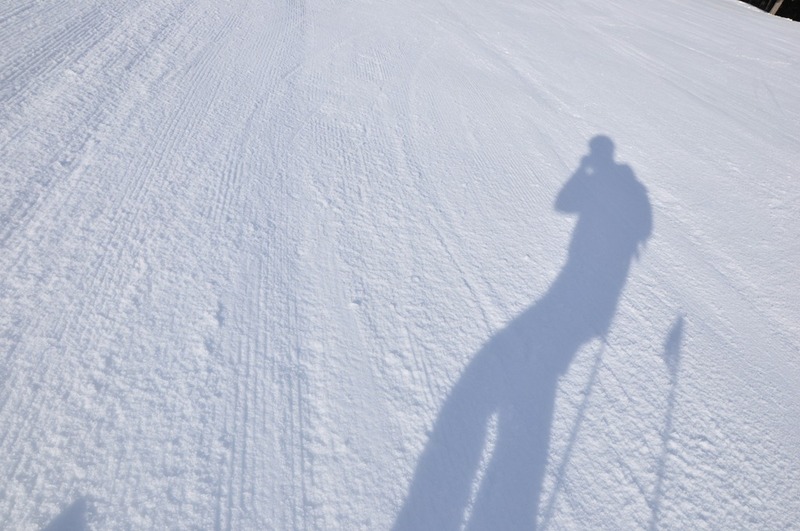 It is so cool to be able to go skiing in shorts. What a great day on the mountain. Yup, writer will be coming soon in QFE form. No major changes, the only thing that has really changed is secure sign ins. Now I want to post a photo album to make sure it works. This is a set of photos I sent to my mom to help us create new bumpers. She needed to look at old bumpers to see how the are built. This is an album that I already created online. Just a quick note to remind myself to blog about what I am investigating. Currently I am looking at what it takes to rip my DVDs. I like having them on my PC so they are available via my Media Center interface. All my movies without having to worry about the actual disks. Last night I spent some time messing with DVDFab Platinum to find the right settings to get a single file that renders in Windows Media Player and Windows Media Center. The nice thing is that I don’t have to use separate software to handle the encryption because DVDFab handles that. However, I still have not found the right settings to get the files onto the PC. I tried to use the VOB pass through setting but I cannot fast forward and rewind movies which is not cool. When I have everything worked out I will post the entire process here. I did learn about one new piece of software, handbrake (from www.handbrake.fr), but it looks like I will need AnyDVD to get through the encryption. I will post results once I investigate. How do you make a logo? I am not talking about how you draw it. I can get around in MS Expression Design or Adobe Illustrator but what I want to explore is how I do I make a good meaningful logo for my web site that ties into then name of the site and embodies the purpose for the web site. With that in mind I went searching for a book or web site with helpful information. Killer Brands has a lot of neat stories of how a brand can make a company great and how a great company can make a not so good brand recognizable but not much on how to create an icon. These steps were interesting and of course I took to "The Icons" step right away. I will post more about what I found later.